The decision to clean an historic building is not one which should be made lightly, as cleaning can have significant physical and visual results. A period of detailed investigation must be undertaken to determine whether cleaning should be undertaken and, if so, the details of how this should be done. The nature and condition of all substrates must be understood, not forgetting pointing materials, as must the soiling to be removed. The latter may include atmospheric soiling, paint, limewash, metallic staining, anti-pigeon gel and graffiti. Each can require a different cleaning approach or at least modifications to the system selected for use elsewhere. Every cleaning system can be used correctly or incorrectly. Poor cleaning should not be blamed on poor application alone as it is often the result of incorrect selection of a process. Glossy trade literature is no guarantee of correct selection. The design of a cleaning regime for an historic building is often deceptively complex, requiring specialist professional input. The purpose of cleaning is to remove soiling, often a source of long-term deterioration to masonry, while causing little or no disruption of the masonry beneath. This can be difficult to achieve due to the intimate relationship between the stone and its soiling, as the soiling can be embedded deeply in between the surface particles. Several published sources now exist which outline the basic constituents of various historic masonry materials and the susceptibilities of these to selective cleaning procedures. Previous experience must also come into play in assessing surface conditions and characteristics particular to the job at hand. The basic principles of any cleaning process must be determined if it is to be considered for use. Works should be undertaken by skilled supervisors and operatives from specialist masonry firms experienced in the cleaning of historic masonry. Air abrasive cleaning systems are usually considered when soiling is not water-soluble and when, for reasons of site logistics or material incompatibility, chemical processes are inappropriate or less preferable. A wide range of air abrasive techniques is currently available. These include a variety of machines, nozzles and abrasives from Hodge Clemco, Neokleen, Liquabrade, JOS and the suppliers of pencil abrasive techniques. Some larger scale equipment can be used in a very versatile and sensitive manner. All air abrasive techniques operate by directing particles of abrasive onto the soiled masonry in a stream of compressed air. Cleaning is accomplished by impingement of the particles which dislodge or pulverise the surface layer of the masonry. This may be the layer of soiling or the stonework or brickwork to which it is attached. Most systems also involve the use of water, either additional to the air/abrasive stream or combined as a slurry with the abrasive. The main effect of the introduction of water is to reduce dust (both dry and wet abrasive systems clean in a similar manner), although the mist produced is still a health hazard. Air abrasive cleaning techniques are most successful on surfaces of even profile and consistent surface texture and hardness. An air abrasive stream cannot on its own differentiate between the removal of soiling and the removal of masonry. Nor can it distinguish portions of masonry which are closer to the nozzle from those further away or areas of masonry which are softer. Damage to the masonry can only be avoided through the skill and ability of the operator to make the necessary adjustments in technique. Air abrasive cleaning is usually most successful on plain stone surfaces of even hardness. 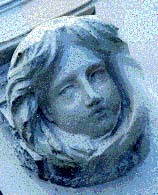 Careful use can enable the technique to be employed on moulded and some carved stone surfaces. However it is difficult to successfully clean brickwork by abrasive means without any damage, due to the many variations in surface texture and hardness that are often present and due to the intolerance of many bricks to its impact. The removal of hard, traditional paints can rarely be achieved successfully from any masonry surface using air abrasives. In the normal use of abrasive cleaning, two factors are of utmost importance; the velocity and the concentration of the particles which impact on the surfaces. These parameters are controlled by the pressure and volume of the air flow and the concentration of abrasive feed into the line. It is therefore not adequate to specify pressure alone. Important parameters will also include the size of the abrasive particle, its shape and its hardness. Commonly available abrasives for facade cleaning include aluminium silicate, calcium silicate, olivine and calcium carbonate. More specialist materials are also available, particularly for pencil abrasive equipment used by conservators. Nozzle shape, nozzle size, rate of water flow and working distance must also be established. i) Smaller particles of the same abrasive type can be less damaging than larger ones, used in the same manner. ii) Harder abrasives can be more damaging than softer abrasives of the same size, used in the same manner. iii) A higher concentration of abrasive particles can be more damaging than a lower concentration, all other factors being equal. iv) Higher air pressure and volume can be more damaging than lower air pressure and volume, all other factors being equal. v) A closer working distance between the end of the nozzle and the masonry can be more damaging than a greater one, all other factors being equal. vi) Depending on how they are used, some small scale abrasive systems can be as or more damaging than larger scale systems. vii) Differences in technique will be required for plain and carved surfaces, sound and deteriorated conditions. General recommendations cannot be made in relation to air abrasive cleaning, any more than with any other cleaning approach. Pre-contract on-site trials are always recommended for the cleaning of historic masonry. These should be overseen by an experienced professional who can observe and assess the effects of each procedure and produce a detailed specification for the works.